My life, under the microscope...: so much for simple! I've been doing lots and lots of preliminary thinking about the knife scrim. I do my thinking in Photoshop, by cutting and pasting in reference material, playing with the scale, moving things around, adding, deleting, and generally pondering the composition until I get it just right. It saves me lots of drawing time. Photoshop, though often used and abused, is a FABULOUS tool. Once I get the compositions how I want them, I print them out, and then (here's where I am right now) I will sketch them out by hand. Could I trace photos? Sure, but it feels like cheating. And hand-sketching allows me to correct photo distortions, add detail, simplify areas, etc. Plus the forms just come out with so much more... life! I'll go into more detail with the drawing stuff when I work on that. Oh, I'm a firm believer in using a grid to transfer an image. I suppose some people can whip out freehand sketches that are proportionally 100% accurate, and with practice I probably could too, but when I want to be SURE I've got everything right, grid it. (Don't worry, I'll talk about what this is). Okay, so the knife scrim image/design/subject was left entirely at my discretion, which is as supremely cool as it is daunting. I finally picked subject matter (zebras), and came up with a real showstopper idea for the "front" of the knife. I didn't like the idea of leaving the back blank (though I need to talk to the knifemaker and be sure he's okay with a front and back design). So I was going to do something really simple on the back. But it just didn't feel right to have this wowzer image on one side and boringness on the other. So now I have come up with a showstopper image for the back as well. Because I'm crazy like that. But I'm going to email Don right now and see if he actually wanted me to leave the back blank. I am mind-bogglingly excited about this knife, and determined to give it my best effort and make a masterpiece (and hopefully it'll sell soon so I can get paid, I don't get paid til it sells, but my goal is just to do the BEST I can do). 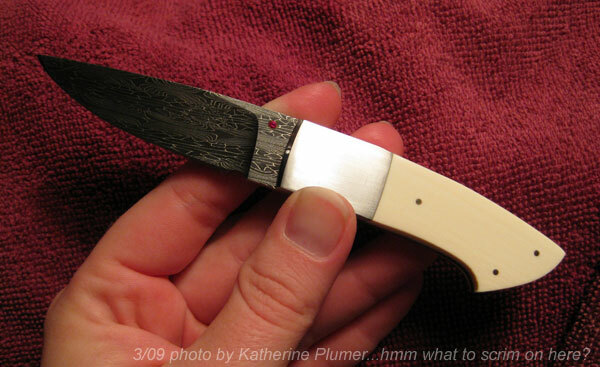 It's also under major time constraints, since it will go to Blade Show even though I won't. My mind was even more boggled today when I received a request to collaborate with a very respected engraver on a hugely significant project. The downsides: same deadline as the knife (yikes!) and it won't ever pay, BUT the publicity is going to far outweigh that! I'll tell you what this is when I get the box in the mail! :-)!!!! I gotta get these stupid taxes done so I can do nothing but scrim for the next month! That is nice! Will the knife be on the makers table in Blade Show? (Fortunately I know the maker, so I know where to look for it :)). Yes (assuming I can get it done and sent off by then, which is obviously going to be the big challenge!) I wish I could go, but it just isn't in the cards this year.